Schwalbe have gone from a rare sight on the trails in the UK to being one of the most popular aftermarket brands here over the last decade – and the Magic Mary must take a big share of the credit for their current popularity. The German brand initially gained ground over here with light, fast-rolling XC tyres like the Nobby Nic and Racing Ralph – and they are still very popular with the XC crowd thanks to a bewildering array of wackily named offerings. But it’s the Magic Mary that is arguably their most iconic tyre, bursting onto the DH scene a few years ago with the promise of superior grip in the slop – it turned up with the logos blacked-out on numerous pro bikes whose owners were sponsored by other brands. There’s definitely a bit of magic in that toothy knob pattern. Kind-of an evolution of the Muddy Mary (a tyre I owned and loved), I can only guess that the “Magic” in the tyre’s name comes from its ability to offer amazing grip in almost any circumstances. As you can see from the pics – it has a meaty tread pattern with chunky side lugs and alternating rows of two and three slightly ramped centre knobs. 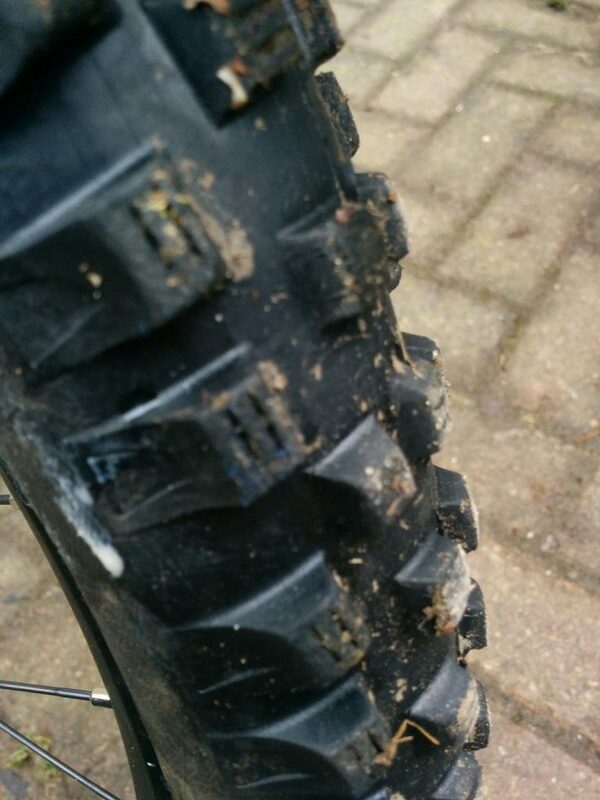 There’s enough space between those knobs for the tyre to clear well in most kinds of mud, but they’re close enough together that you don’t get the dodgy skating sensation that mud tyres usually give on rocks and hardpack. In fact the Mary is in its element on rocks with the generous 2.35in casing helping make it feel surefooted and predictable in places like the Lake District or the Highlands. On the subject of the casing, this is another area where Schwalbe have scored a bullseye in my opinion. The Snakeskin version seems to be just tough enough to withstand fast riding on rocky trails, while the Super Gravity version I picked up for a trip to Italy gave total security for a very small weight gain. My first experience of the Mary was in the Vertstar Super Gravity format and I’ll be honest, it was hard graft pedaling it around – but I’ve since switched to the less sticky Trailstar compound and haven’t ever found myself wanting for grip. Those meaty corner lugs provide great off-camber grip. If the tyre has a downside it’s that it sometimes has too much grip for the situation at hand, on hardpack or nice loamy trails I’d probably prefer a High Roller 2 or On One Chunky Monkey. But if I had to pick one front tyre for enduro-style riding (for want of a better word), it would hands-down be the Mary. Nothing else comes close for versatility and security. 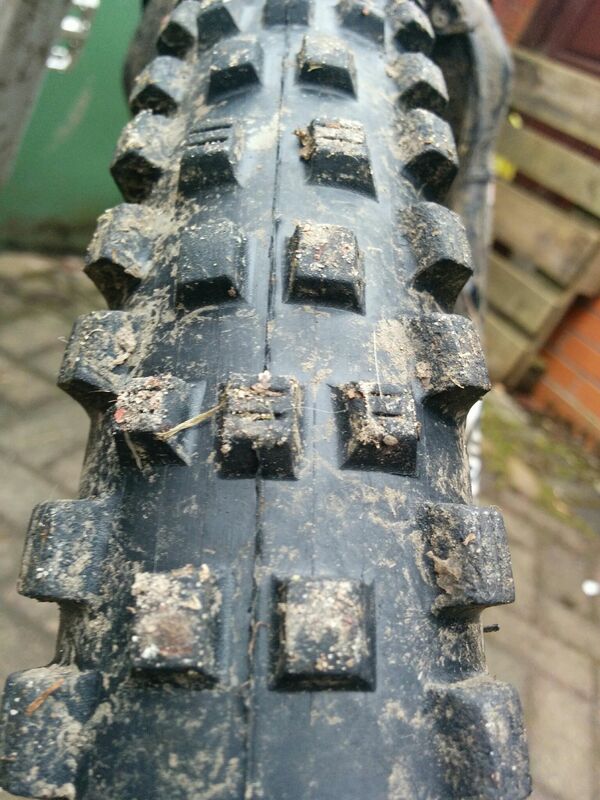 Note: Tyre tested in 650b and 29er formats, only on the front – I’ve not been brave enough to try one on the rear yet.